I recently came across this article that discussed how the author went from overly post-processed images when he discovered Photoshop then slowly toned it down to get to where his images are now. This really got me thinking about my own images and how much post-processing I’m doing on them. I figured I might share the editing that went into this photo as well as the thought process behind each step! I used two software, Lightroom and Photoshop, for the edits on this. Most of the edits that I did on Lightroom you should be able to do when you open the RAW file in Photoshop. That said, let’s get right to it. Lightroom: I use this mostly for cataloguing my photos and doing quick edits. Batch processing is also done here where all the images get the same basic treatment before I export the JPGs for editing in Photoshop. The first thing I have been doing for all my photos is to apply the following basic edits: Contrast – 13, Shadows – 45, Clarity – 23, Vibrance – 50, Saturation – -10. I wanted the ice cream to pop a bit more so I did that is by boosting the contrast. 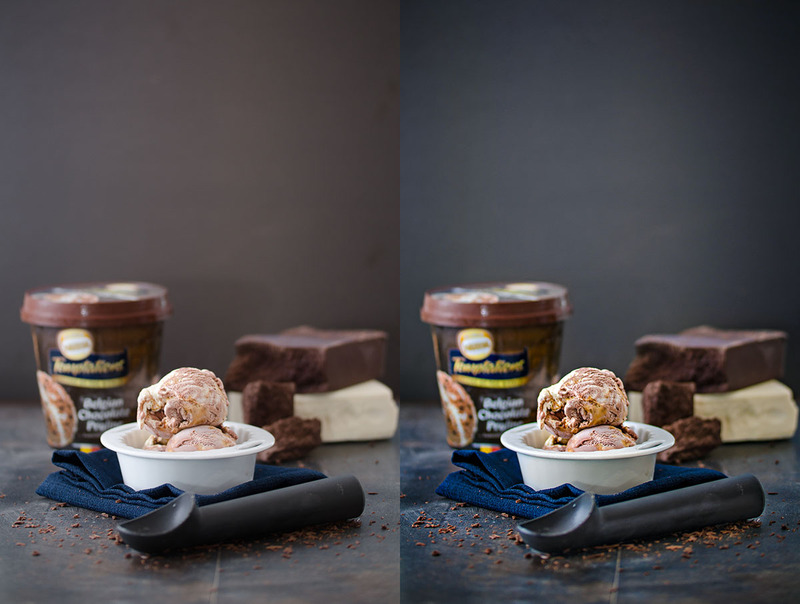 There was some details that was lost in the ice cream scoop so I increased the exposure for that section. I noticed that there was also a colour cast on the bowl from the blue cloth so I warmed this up a bit. With that done, it was time to go to Photoshop! Photoshop: This is where I do the finer tweaks for the colour and contrast adjustments. First thing I did was to cool the photo down a couple of notches. This was to make it fit the subject which is obviously cold. Next, I wanted to fix the background. I noticed the gradient from cool to warm so I added a Color Balance layer to cool the warm portion of the background. After doing this, I noticed that there was some magenta/green colour cast so I desaturated the greens and magentas on the background. I also added a Levels layer to brighten the shadow on the background then just adjusted the opacity to match the exposure of the rest of the background. I then duplicated the image layer and cloned the spots out for a more even background. Next was the tile. I added a Curves layer to increase the contrast to give it more texture. Last steps were to run my usual LAB Saturation boost action and my sharpening action. That’s about it for the workflow that I did for this image. It was really heavy on tweaking the little details to match the dish that I shot. If this were a different item, I would have probably skipped the part on the vignette and the colour temperature might have been a bit warmer. Again, this is really up to the image that I am editing. I would love to know what your thoughts are on this. Constructive criticism will be very welcome! Cheers! Thank you for sharing your workflow, it’s really useful to hear how other people do it. What a fantastic photograph! It really does, I really like seeing the pictures of your set up, I always assumed that people had slate on their kitchen walls and wooden tables, but now I see it’s a case of collecting the materials and staging it!